Vinyl is so versatile that many types are designed specifically for window and glass applications. 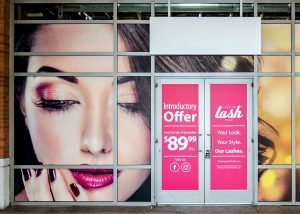 Whether you are wanting to create an eye-catching window display or would like to provide patrons with privacy, Saber Sign Solutions has the perfect vinyl solution for you! Window film is ideal for giving your business that dynamic, up-to-date appeal. At Saber Sign Solutions, we help you create decorative displays out of glass spaces, and we help you use those decorative displays to advertise your brand and motivate viewers to purchase your services and products. Affordable, highly customizable, easy to remove/replace/reuse, window stickers and films can serve as promotional displays for seasonal updates, sales, announcements, new products, and services, etc. 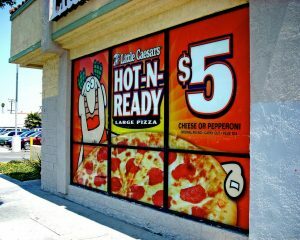 We can create individual graphic elements, or completely cover your windows with your custom marketing message. 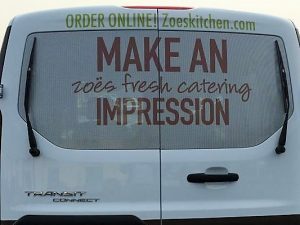 Using high-quality perforated window film on your side and rear windows, we can make your vehicle perfect advertising canvas. Saber Sign Solutions is all about taking care of clients, so we make sure that the window decals we use on your windows are see-through. We make sure that they do not compromise the driver’s view and do not get in the way of road safety. Saber Sign Solutions has been a trusted full-service signs provider for years now so you can count on us to deliver the kind of service that your business needs. 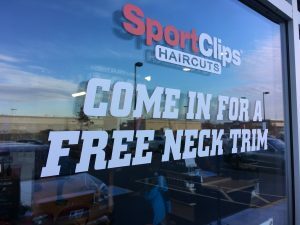 Whether it’s custom-crafting promotional designs, printing full-color window decals, professionally installing window clings, and cleanly removing outdated window films, Saber Sign Solutions has got you covered. Affordable, easy to install, easy to remove, and easy to replace, window films are a practical solution for businesses that want to provide a degree of privacy but aren’t quite ready to invest in replacing entire glass panes. Saber Sign Solutions has a wide selection of window films to choose from, so you’re sure to find a signage option that best fits your business needs as well as your budget. A popular choice for our customers would be frosted films. They offer some translucency to your windows, perfect for businesses that are aiming for a soft, relaxed vibe. A Saber Sign Solutions frosted film’s matte finish also makes it great for diffusing harsh light, reducing glare, providing shade, and providing cooling. Another option you can go with would be one-way mirror films. Available in a variety of shades, grades, and types, one-way mirror films by Saber Sign Solutions make glass and windows highly reflective on one side (giving it a mirror effect) while remaining relatively transparent on the other side. They also offer extra protection from harmful UV rays. Saber Sign Solutions has been doing signs, graphics, decals, and films for a long time, and we’re confident in the quality of signage that we produce. With a strong team, high-quality materials, top-of-the-line equipment, and excellent work ethic, we are the window film provider you might just be looking for. We handle all aspects of sign-making and can help you out every step of the way. From planning, design, printing, installation, maintenance, and even removal, you can surely count on Saber Sign Solutions. Having been a trusted local signage and decal provider, we know how important it is for businesses like you to partner with a company you can trust. Saber Sign Solutions can be that company. 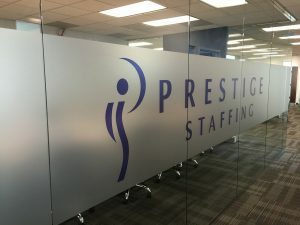 We are dedicated to delivering the best signage design for your brand, the highest quality window films for your business, clean, professional installation, and outstanding support for your peace of mind. Call Saber Sign Solutions today at (512) 861-2699 for your Free Consultation with a Window Film Expert!